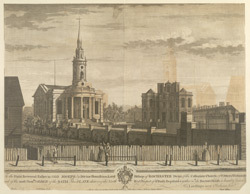 St Paul's church was one of fifty new churches proposed for London in 1710 as part of the regeneration programme that followed the Great Fire of 1666. It was designed by Thomas Archer, who also designed St John's in Westminster. Both churches display Archer's passion for the Romanesque Baroque. The fabric of the church and most of the decoration was completed by 1720, but construction work continued right up to the church's consecration in 1730.